There are hundreds of products to choose from. The internet and your local pharmacy offer many types of inserts and arch supports. Through trial and error sometimes these off-the-shelf remedies work. If your foot and ankle problem is not getting better or gets worse, itʼs time to seek a professional. For example, heel pain in addition to plantar fasciitis may actually be a stress fracture, entrapped nerve, or even a partial tear of the plantar fascia. You need a proper diagnosis and treatment plan. 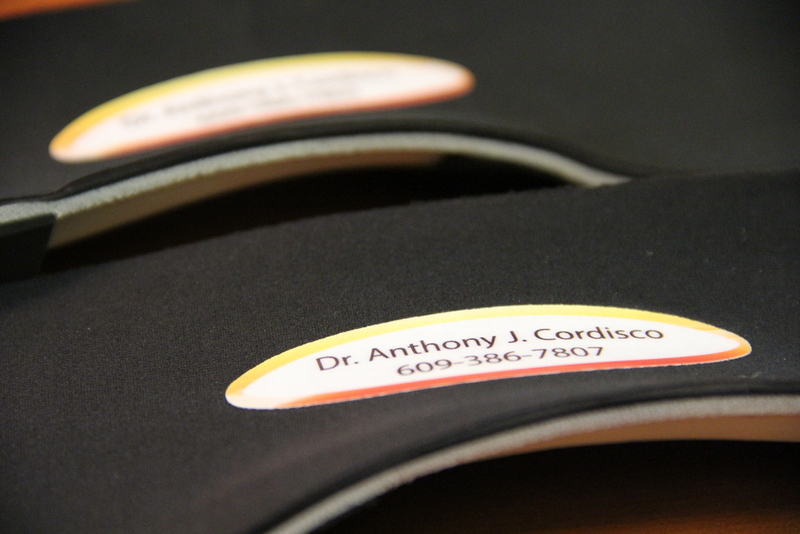 We offer custom orthotics made from plaster impressions of your feet, with the necessary prescription and corrections added for your particular foot abnormality. Years of treating athletes and military personal have offered Dr. Cordisco great expertise in dealing with your particular foot/ankle condition. When the running and aerobics craze began in the early 1980ʼs, Dr. Cordisco was at the beginning; lecturing, writing articles and treating professional and amateur athletes. From ballerinas to professional football players, Dr. Cordisco has been treating sports related injuries for over 30 years. He was a consultant for the Philadelphia Stars U.S.F.L. professional football team where he treated Kelvin Bryant. He has also treated members of the Pennsylvania Ballet under the direction of Pat Croce and Dr. Nicholas Dinubile. Delaware County Memorial Hospital Sports Medicine Institute was one of the first facilities in the Philadelphia area to provide services exclusively for sports related injuries with a team approach. With a complete team approach to treat the injured athlete, the Sports Medicine Institute provided Orthopedic Surgeons, Physical Therapists, and Fitness trainers. Dr. Cordisco was a part of that team, serving as one the their sports Podiatrists. As sports medicine expanded, he later became a part of Pat Croceʼs Sports Medicine team at Holy Redeemer Hospital Sports Medicine Institute. He provided top notch podiatric care to professional, collegiate, and amateur athletes. Diabetes continues to be a major health problem of todayʼs society. Infections, amputations, and hospitalizations continue to place an inevitable strain on the healthcare system. The goal is prevention. It is important that Diabetics see a podiatrist on a regular basis. With poor eyesight, neuropathy, and arthritic hands, many injuries and infections are caused by the patient themselves. Please seek professional foot care by a podiatrist that has years of training in complications, techniques, and provides a clean environment with sterilized instruments unlike your local nail salon. Having your feet soaked, massaged, and toenails polished is one thing, but cutting and scraping of corns, calluses, and ingrown toenails removed should be done by a professional if you have Diabetes. Take care of your feet and do the right thing, see a Podiatrist.